Since this time last year, there has been a lot of change on the Toronto Raptors. A number of franchise mainstays are out, replaced by newer faces such as Kawhi Leonard and Marc Gasol for a rejuvenated playoff run. It’s an exciting time to be a Raptors fan, for sure, but there will always be that bit of sentimentality reserved for players such as DeMar DeRozan and Jonas Valanciunas who have also been significant contributors in recent Raptors runs. 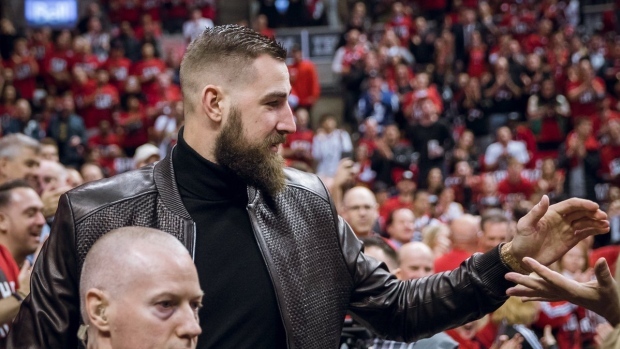 With his San Antonio Spurs also competing in the playoffs, DeRozan couldn’t come through, but JV made his way to Toronto for the Raptors’ Game 1 against the Magic, and as you could imagine, he was greeted with a *very* enthusiastic response. JV wasn’t the only former Raptor to show for Game 1. Lucas Nogueira, Alvin Williams and Muggsy Bogues are also in attendance! Among the former Raptors in attendance for Game 1: Jonas Valanciunas, Lucas Nogueira, Alvin Williams, Muggsy Bogues.